Comments: Great Mix up Pipe Music! The album starts off on a classic pipes tune with heavy drums and the next track progresses to electric guitar riffs. This is a good mix of the old and the new. While the old stirs visions of Scottish soldiers coming over a highland hill top charging toward battle, the new conjures images of a smoke filled Scottish pub rocking out through the night. If songs like Amazing Grace or Scotland the Brave are you're only interest in pipe music you probably would not be as fond of Stomp but if you enjoy the classics with a little more to offer as well as bands like Clannadonia and Saor Patrol then this is definitely one to add to your collection. 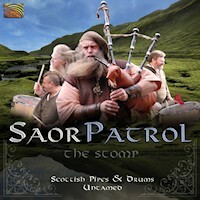 Want to write a review about Saor Patrol's The Stomp album? Post your comments in this box to be displayed in our community forums and in our album database! Please make sure you are logged in before proceeding. Please login to write your comments about The Stomp.